While Windows users are happy to see a wide range of useful applications vying for their attention, the Mac users are unfortunately facing with limited choices. Doubt about it? Look at Nero, a comprehensive CD, DVD and Blu-ray write, play and edit suite, for example. Many users who have switched from Windows to Mac painfully find that this professional DVD burning software doesn't support Mac operations system. Yes, efficient and useful as Nero may be, it runs only on Microsoft Windows and Linux and no Mac version has been offered. Therefore, Mac users are forced to look for a Nero for Mac alternative. Fear not, also a range of DVD burner software are here on the market. Though Nero is incapable of supporting Mac operation systems, this doesn't mean it's impossible to burn disc on Mac anymore. Google the DVD burning apps and you can get tons of software like Nero that works with Mac OS. For example, Roxio Toast, SimplyBurns are capable of burning DVD discs, creating data, video and audio discs, many of which however, are fatally flawed to copy protected DVD to DVD. There is an important factor that you should pay attentions to: copy DVD to DVD. Why is it difficult? The difficulty lies in the copy protections that many DVD companies applied to their released DVDs for infringement prevention purpose. To put it another way, most DVD burning software crushes out or delivers unsatisfactory video quality when it comes to copy-protected DVDs. Does this mean that your attempt to copy DVDs from major distribution companies like Disney, Paramount etc to DVD will end here? Take it easy, here a world-renowned Nero for Mac alternative offers a hand to remove the DRM copy protections and backup the copy-protected DVDs to ISO image for further DVD burning. MacX DVD Ripper Pro delivers a comprehensive DVD copy solution. With this DVD ripper similar to Nero, you are entitled the freedom to copy DVD to hard drive, DVDs to ISO image, MPEG2 and MKV with 1:1 image quality, regardless of any copy protections like Disney X-project protection tech, and common Sony ARccoS, CSS, Region Code, UOPs techs etc. In other words, now you can freely copy any DVD movies you want like Big Hero 6, Taken 3, American Snifer, etc and many more to ISO image for later DVD burning as well as better storage. 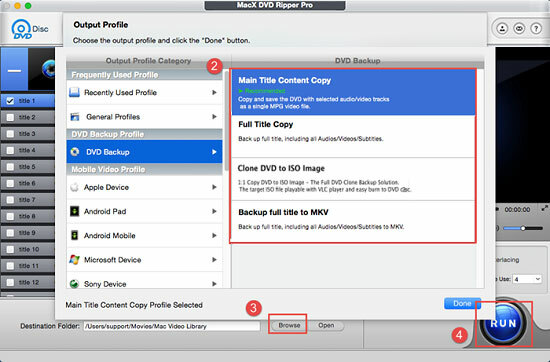 See the following tutorial about how to copy a DVD on a Mac. Step 1: Free download and launch this remarkable DVD ripper on Mac, then click "DVD Disc" button to import DVD from your computer. Step 2: Click "DVD Backup" on the list and select "Clone DVD to ISO Image" mode. Step 3: Click the "Browse" button and choose the location where you would like to save your DVD output file. Step 4: Click "RUN" to start copying DVD to ISO image. Additional information: If you are not meant to burn DVD, but also want to transfer DVD movies to play them on iPhone iPad on the move, you can use MacX MediaTrans to sync the converted DVD movies to iPhone iPad instead of the complicated iTunes sync. Note: After you get the ISO image file, you can burn it to a blank disc with the help of iDVD or other DVD burner software.